Pleading to gods in masked faces in front of Temple Trees -- to lay siege round official house with candle-lit poojas to prevent President from coming out! the Joint Opposition has organised a protest under the name 'Jana Balaya Colambata' at 2 in the afternoon in Colombo. It's slogan is 'let's dismiss the government which destroys the country ... let's lay a siege in Colombo'. 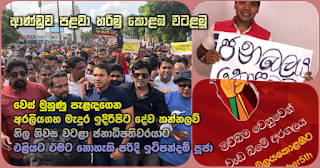 Its chief organiser Namal Rajapaksa and the crowd has taken steps not to reveal the location where the protest rally is to be held. Colombo would be obstructed in this connection and under these circumstances some people arriving for official duties from outstations had decided to go on leave and most festivals and celebrations on a business level and entertainment status at hotels and restaurants are observed to have been postponed. In the meantime, among chief reasons for this protest, the United Opposition has pointed out as monks being imprisoned, not having elections, burden of taxes and cost of living. However, what the government say is that special court procedures being launched last week and a number of legal cases beginning with Johnston and those connected to United Opposition inclusive of Gotabhaya and Namal are to be examined and they are to be punished, these protests have been organised in order to interpret it in a form of revenge for their loss of dignity. Though four police stations have contacted courts yesterday to ask for orders to restrain activists saying that there is a possibility that the Presidential Secretariat, Temple Trees and places such as the parliament, they were turned down. Instead, the court advised police once again only about the action to be taken in the case of an emergency and powers to enforce in such cases. Intelligence information has been received that these protestors are planning to gain access to the Prime Minister's office and Temple Trees and to behave in an aggressive manner and that another faction is to wear masks and engage in making a plea before gods and rituals in front of Temple Trees and Prime Minister's office and further, they are to lay a siege round President's official house down Malalasekera Mawatha and are planning to take action against the government by lighting candles on that day till the next day so that the President is unable to come out, according to information conveyed by Colpetty and Cinnamon Gardens police. However if unnecessary action is to be taken ... the police are permitted to take action to control such action and that no prohibition orders are necessary, the magistrates informed. In the meantime, a prohibition order requested by Talangama Police to prevent activists from entering Polduwa roundabout from Parliament roundabout was turned down by Kaduwela magistrate, Mr. Prasanna Alwis. Court orders were issued to the effect that if by chance the activists behave in a manner that they cause public hindrance, to take action in accordance with the relevant legal procedures. Additional magistrate Mrs. Neranjala de Silva who took into consideration a request made by Welikada Police to issue a court order to conduct the protest in a peaceful manner if they assemble round the parliament, said that a prohibition order of court is not required for a peaceful gathering; but to do so in a peaceful manner. But if they behave in a manner where common property is damaged and gains entrance to State institutions in an unlawful manner ... then take them into custody according to the relevant criminal cases ordinance and relevant police act.